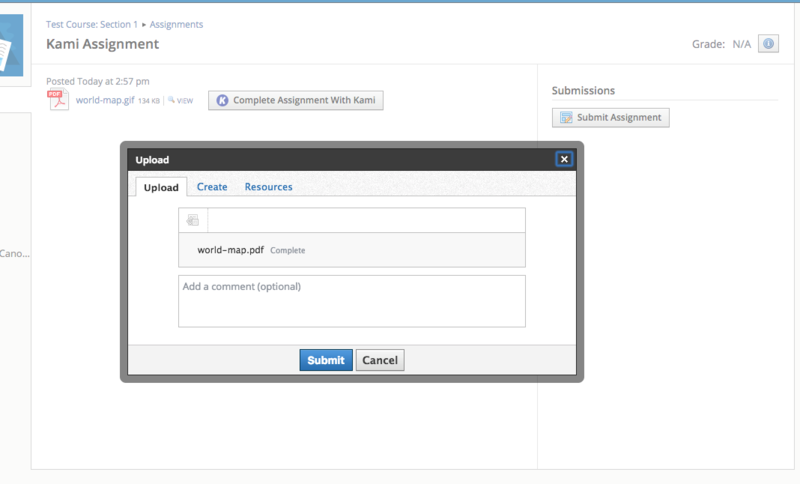 Kami's new, streamlined Schoology integration allows Kami assignments to be created inside Schoology, distributed to students with each student getting their own copy of the file, and makes it easy for students to turn in their work when they are done. This integration is only available with a paid Kami Education plan (i.e. the Teacher, School, and District plans). Note: This integration uses the Kami Google Chrome extension, and will only work with Chrome. It also requires that the Teachers and Students have Google accounts as it integrates with Google Drive - if you'd like to use this without Google login, let me know at jordan@kamihq.com. Ensure the Kami Extension is installed. There is no need to install a Kami app from the Schoology App Store - instead, the Schoology integration relies on the Kami extension being installed for Teachers and Students. You should see the blue K icon showing at the top right of your Chrome Window - if its not there, go to the Chrome Web Store to install the extension. For the best experience, we recommend that your IT department rolls out the extension to all your users following the instructions here. Choose a file from your Google Drive, or upload one using the 'Upload' tab. 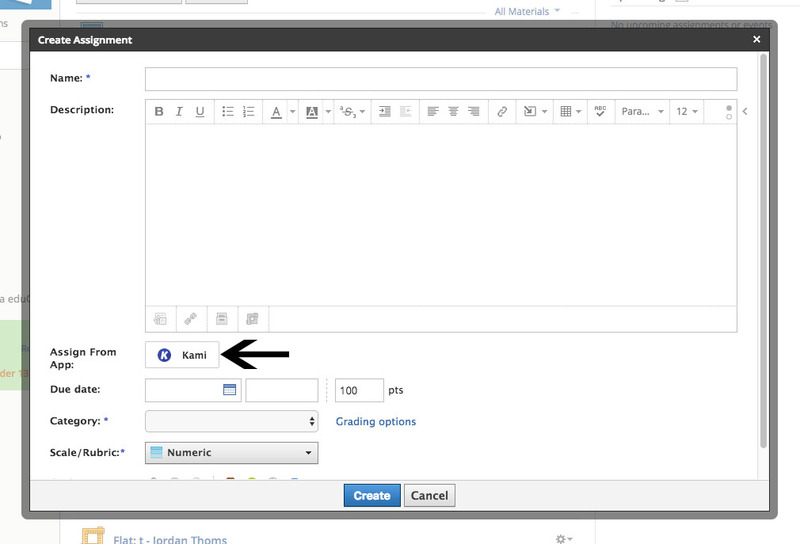 You can select a PDF file, or a different file type which Kami supports for conversion, e.g. Image Files, Word, Powerpoint, and many other formats. 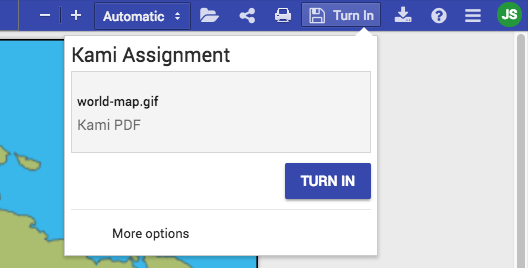 When Students click that button, Kami will open and load the file. The File will be automatically uploaded to the Student's Google Drive, and also shared with the teacher's Google account, so they they can view the work in progress. 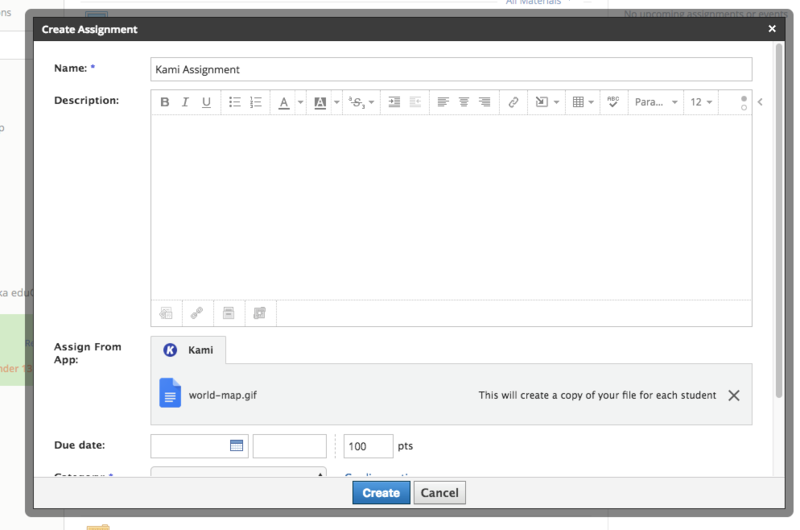 Note: The first time a student uses Schoology with Kami, we will ask them to select the Google Drive account for the "Kami Schoology Assignments" folder. Note: If the students come back to Schoology later and click the 'Open Assignment' button again, they will get the same copy of the file so they can continue their work. 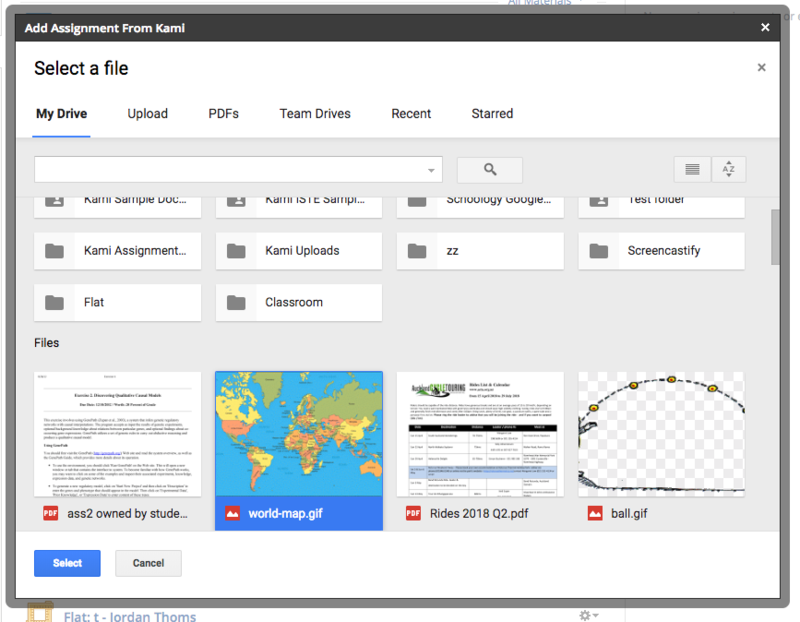 Students can also open the file with Kami directly from their Google Drive, and continue their work or turn in that way. The file is now attached as a normal Schoology assignment submission, and you can mark it and assign grades using the usual Schoology tools.